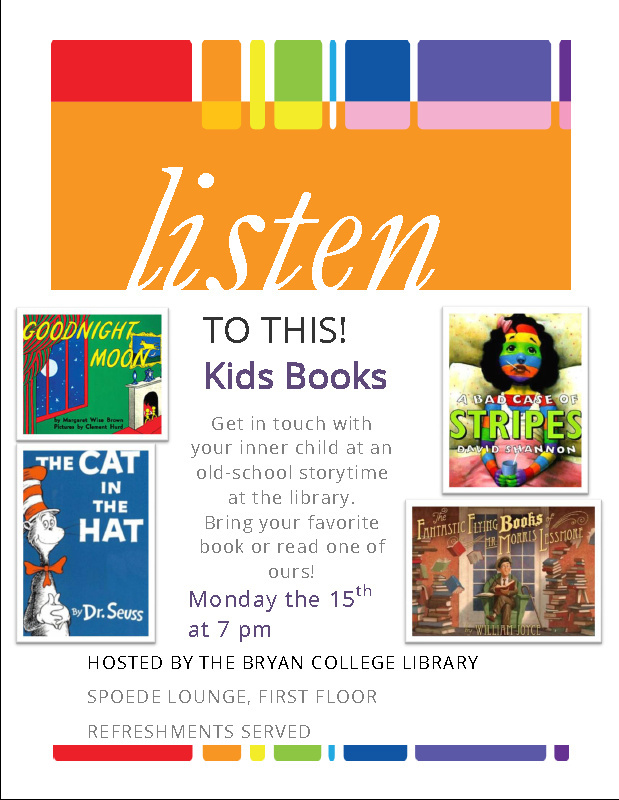 Here at the Bryan Library, we have an event series called Listen to this! 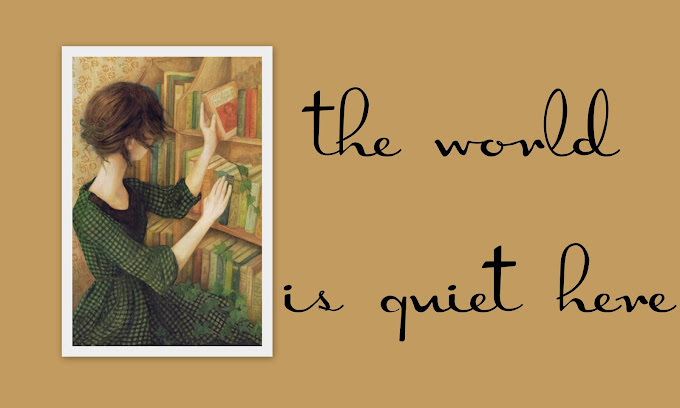 in which about four times a school year, we plan an evening of readings around a theme. We'll have anything from faculty and staff reading select passages of their favorite books, to local authors from the Chattanooga Writers Guild reading their works, to members of our own student body reading their stories and poems. Perhaps my favorite is the one I just worked on planning with our Outreach Librarian, Keri-Lynn, which featured childrens books. The campus was invited to come and read/listen to their favorite books from childhood. Keri-Lynn asked me if I wanted to get involved with planning it and after a meeting a few weeks prior to the event, she let me take the reins and go. A couple of things went in to the planning of this event, while the date and theme was already set, making things pretty simple, I had to come up with advertisement to communicate the event on campus. This included everything from powerpoints for digital signage and posters to campus wide event emails, and chapel announcements. and then came the night of the event! With the help of Keri-Lynn's two kids, I got Spoede Cafe (technically the only room in the library in which food is allowed) prepared, arranging the armchairs in story-circle fashion, laying out the cookies so graciously provided by our Public Services Librarian, Ms. Vonnie, and bringing out the cart of hand-picked books. Librarians like statistics. We like to see how effective we are by our numbers, we catalog, we organize, we analyze. I now know that there is nothing scarier than planning an event and waiting for people to show up. I knew that at the very least, there would be me, Keri-Lynn and her two kids. We could read books for an hour and eat all the cookies, but I really wanted my publicizing work to have been effective, therefore, I was nervous. But everything turned out ok. My best friend and her fiance showed up, as well as a sweet freshman girl who told me she'd had the event marked on her calendar for weeks and was really excited about it. She even went hunting in the stacks to find her very favorite read-aloud. These are the patrons that make me feel good about my job. Everyone (except my friend's fiance who makes it a point to flaunt the fact that he doesn't read for fun in my face) read a book, including Keri-Lynn's normally shy daughter. It was a pretty good first expericence with event planning.